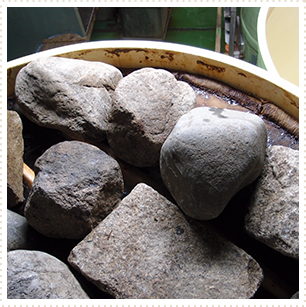 We were founded in 1918, and we continue to make miso in our warehouse in Ashiya (in Hyogo Prefecture) while elaborately preserving the traditional technique. 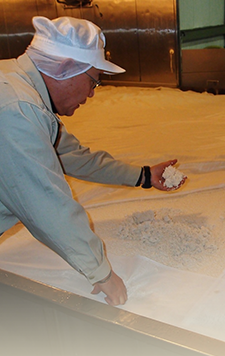 We particularly insist upon (1) malted rice lovingly made, (2) brewing naturally in our Ashiya warehouse, (3) careful selection of materials. Rokko Miso is a red rice miso with a high proportion of malted rice, slowly matured with reduced salt. 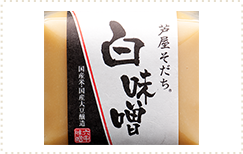 This formula is typical of the Kansai area (standard miso contains 12% salt, versus 10% for Rokkoo Miso), and the characteristic of Rokko miso is fine and careful finishing. 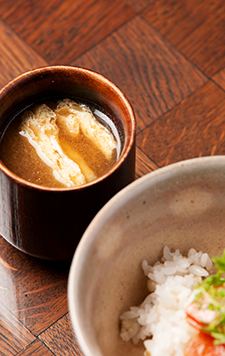 When prepared wholeheartedly and matured slowly, miso has a rich aroma and tastes mellow. Miso is a healthy Japanese seasoning. We also brew a lot of white miso (sweet miso with only 5% salt) which is likewise specific to Kansai. 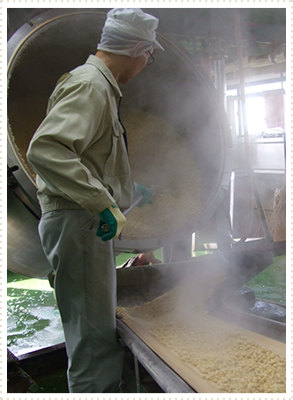 White miso is prepared by using twice as much malted rice as soybean, or more. It is not an exaggeration to say that nothing is more important to white miso than malted rice. Therefore we prepare our malted rice with much time and effort. Rice miso is classified basically into "red miso" ("aka miso") and "white miso" ("shiro miso"). The materials for both these types of miso are soybean, malted rice, and salt. The differences are (1) the type of bacteria for preparing the malted rice, (2) the method of preparation, and (3) the duration of maturing. 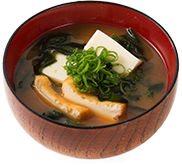 Red miso is a dark colored miso which is brewed slowly and aged by natural brewing over a long period, using malted rice which has been prepared with great care over a long time. This red rice miso is of the salt-reduced type, and contains about 10% salt for health reasons. Both retail and commercial supplies are available. 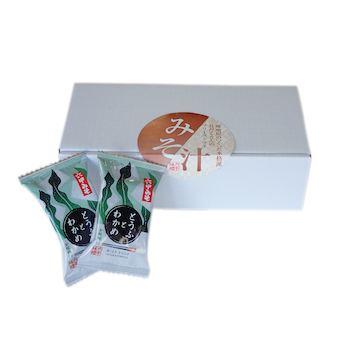 This product has been a good seller over more than half a century, and has a rich flavor and is good for miso soup in combination with various ingredients. 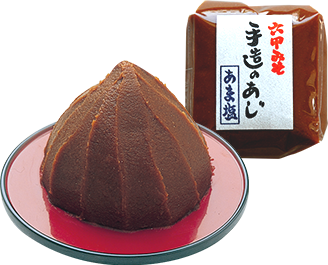 This flagship product represents our company Rokko Miso. 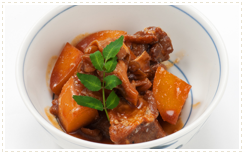 It can be used widely, for example in stewed or fried dishes. Both retail and commercial supplies are available. Due to the malted rice, white miso is mellow and sweet and has low salinity, and its beautiful pale yellow color adds visual appeal to many dishes. 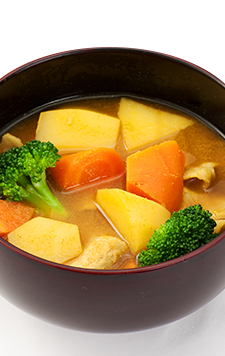 Miso is good not only for Japanese cuisine; it can be used in various cuisines as a subtle flavor (a secret ingredient), giving the cuisine body and making it delicious. 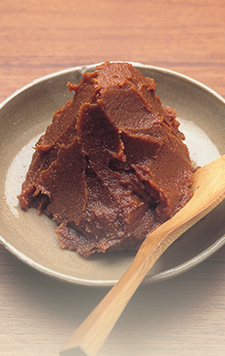 Miso is also widely used as a seasoning, for example in Japanese style condiments or as Dengaku miso, etc. 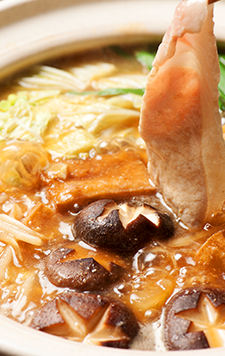 Dengaku is a cuisine in which materials are baked with seasoned miso. Both retail and commercial supplies are available. 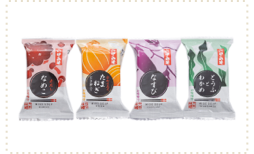 Rokko Miso has spent many years in the development of freeze dried miso soup rich with added ingredients, and has great expertise in the choice of miso and garnishes. When hot water is poured onto one of our freeze-dried soups, the aroma and flavor of Rokko Miso wafts up, and the almost immediate result is a delicious full-bodied miso soup with many ingredients. This is traditional miso soup using aka miso, naturally brewed with a modest amount of salt (10%), employing tofu produced from Japanese soybeans, and a lot of seaweed garnish. 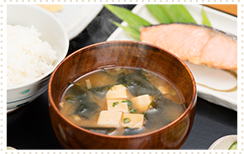 We produce four kinds of freeze-dried miso soup: "Tofu and Seaweed", "Eggplant", "Nameko (red miso soup)", and "Onion". "Kodawari" - Things that we think important. We stick to "natural brewing" which is a traditional manufacturing method and takes much time and trouble. It is not an exaggeration to say that the quality of the malted rice decides the taste of rice miso. 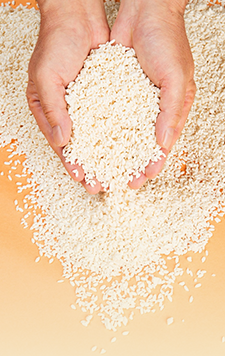 We use rice which is carefully selected, and experienced specialists control the ideal temperature and humidity for the growth of malted rice, in spite of small daily changes of the weather. And they check upon how the koji-mold (aspergillus) is growing with sedulous attention. 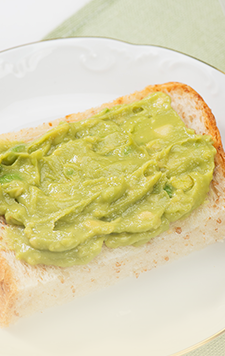 We acquired the Organic JAS Certification in 2014 by making reliable, secure and delicious miso. Seizaburo Hasegawa founded Hasegawa Kanese Shoten as a miso and pickle business in Kobe-shi, Nagata. We relocated to Ashiya, and became a miso-only business. We started to use the business name "Rokko Miso". 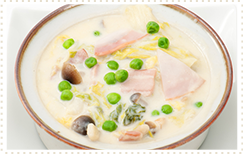 Rokko Miso Co., Ltd. was established, and the second-generation owner Seizaemon Hasegawa took office as CEO. The third-generation owner Kenji Hasegawa took office as CEO. We acquired the Organic JAS Certification. We started upon full-scale renovation of our factory exterior, including installation of a solar power system. We received an Excellent Food Hygiene Facility Award from the Mayor of Hyogo Prefecture. 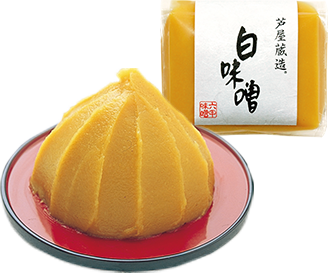 Our product "Tezukuri no Aji" received the Judges Honor Award of the National Miso Evaluation Competition. "Akadashi Miso" received a prize from the Director General of the Food Agency in the National Miso Evaluation Competition. We received a prize from the Ministry of Health and Welfare as an Excellent Food Hygiene Facility. 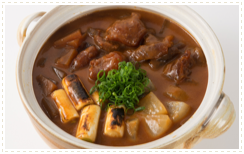 Our "Akadashi Miso" was commended continuously (every year) by the National Miso Evaluation Competition. "Sakamai Jikomi (miso)" received the prize of the Director General of the Food Policy Bureau of the Ministry of Agriculture, Forestry and Fisheries in the Domestic Agriculture and Forestry Products for Sale and Use Section in the Excellent Traditional Village Food Central Competition of 2010. The third-generation owner Kenji Hasegawa received the Hyogo Prefecture Excellent Skills and Contributions Award. 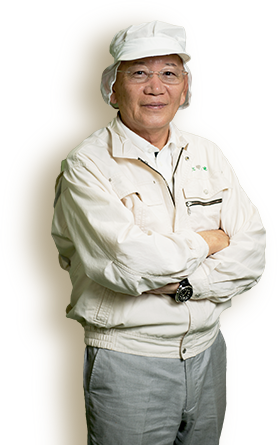 The third generation Owner Kenji Hasegawa received the Food Trade Service Prize of Hyogo Prefecture. *: These items are required. Copyright © Rokko Miso Co., Ltd. All Rights Reserved.